Infiniti is building up its image as an efficient luxurious brand in Europe and this car, the EX Crossover, will help them a lot. It is a high-end SUV which is powered by very efficient engines. Specially this one, with the 3.0-litre V6 piezo-injection engine. This premium car also has very extensive list of standard equipments and a luxury feel all around. The car’s V6 engine develops 175 kW (238 PS) maximum power and 550 Nm from just 1750rpm. Smooth, responsive and lag-free, the V6 has even been tuned to sound like a petrol V6 engine. Infiniti EX30d can sprint from 0-100 km/h in just 7.9 seconds and hit 221 km/h flat out. Fuel consumption is rated at 8.5 l/100km (33.2mpg). With 7.2 l/100 km (39.2mpg) on the extra-urban cycle. Premium versions of both petrol and diesel models come with lots of standard safety features such as Lane Departure, Intelligent Cruise Control (ICC) with full speed range, Intelligent Brake Assist (IBA), and Forward Collision Warning (FCW). Infiniti takes the wraps off the new generation of their QX full-size luxury SUV at this year’s New York autoshow. And while the price of the car has remained the same, it has become larger, more powerful and more efficient. The 2011 Infiniti QX is powered by the same engine that powers the 2010 Nissan Patrol, which is a new 5.6-liter V8 engine with VVEL (Variable Valve Event & Lift) and Direct Injection Gasoline (DIG), producing 400 hp. It’s mated to a 7-speed automatic gearbox. Standard features include a Theater Package with dual 7-inch monitors, Advanced Climate Control System, Standard Around View Monitor, 20-inch aluminum-alloy wheels, power sliding moonroof, power rear lift gate, leather-appointed seating, power folding and reclining 3rd row seats, Bluetooth® Hands-free Phone System, Streaming Audio via Bluetooth®, Infiniti Hard Drive Navigation System with XM NavTraffic® with Real-Time Traffic Information, XM NavWeather™ with Real-Time Weather and 3-day fore cast (XM® subscription required, sold separately) and Zagat Survey® Restaurant Guide. Pricing for the new QX is set at $56,700 for the 2WD model and $59,800 for the 4WD. The Infiniti name plate which arrived on the scene now close to 20 years ago is finally hitting its groove and creating a wide variety of top quality and stylish products. 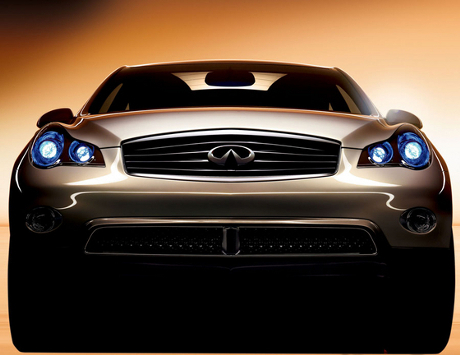 No matter whether you like luxury, sport or utility, you will find it easily in the current Infinity line up. One of the more attractive choices that Infiniti has created is the EX luxury crossover vehicle. Since gas prices have changed the way automakers and customers now think about big, hefty SUV’s a crossover such as the Infiniti EX is quite popular and trendy. This crossover definitely doesn’t disappoint with great styling that is easily recognizable as Infinity and a long list of performance and luxuries found in this vehicle. Under the hood of the Infiniti EX luxury crossover, you will feel the performance as the engine produces 297 horsepower and 253 lb ft of torque. The power plant is a 3.5 liter 24 valve aluminum alloy block which includes a high flowed tuned induction system. Matched with this powerful engine is a 5 speed automatic transmission with a few bells and whistles to make your shifting smoother and more efficient. It should also be noted that the EX is available in a rear wheel drive model or AWD model. By the way this crossover gets decent mileage with highway mileage in the low to mid 20’s. As luxury is concerned, there is plenty of it in the EX. Besides the push button ignition that will make many think of a Ferrari, the interior is made from fine materials, good leather and a wealth of conveniences whether for mom transporting the kids or dad dealing with a long commute. With all these great features, we are surprised that this vehicle comes in at a decent price point- about $36K.